What testimony have men, in the first instance, that there is a God? What excited the ancient saints to seek diligently after a knowledge of the glory of God, his perfections and attributes? How do men obtain a knowledge of the glory of God, his perfections and attributes? Is the knowledge of the existence of God a matter of mere tradition, founded upon human testimony alone, until a person receives a manifestation of God to themselves? From the whole of the first lecture of the second section. The questions and answers above are from the very end of the catechism in Lecture 2 of the Lectures on Faith. These particular questions and answers condense the message of scripture into a few words that take only seconds to read. There is no doubt in my mind as to the source of their inspiration. Based on personal experience, I can soberly state that I know of myself that these words are factual. I’ve been working on this particular article for months, maybe close to a year. I can keep tweaking this over and over or I can just share what I’ve got thus far, so that’s what I’m doing. Because I am a man, I’m writing this from the perspective of a man particularly to the men out there. I’m writing this to me, to the men in my family, my friends, perfect strangers and especially to the men that will dare to go near my daughters one day (sorry, that’s just the papa bear speaking). I’m writing this to hold myself accountable for the things I understand and hope that the information might help improve a relationship out there somewhere. It is up to you to take what is useful and cast aside what isn’t. I’ve been surrounded by females my entire life. I have three little sisters (no brothers) and am a father of four daughters (no sons) and my wife has four sisters. (and one brother, whew!) My life has been heavily influenced by females and so understanding the dynamics of men and women in life and in the gospel has always been an interesting topic to me personally. I recently started the Book of Mormon over again in audio form while I’m at work. Chapter 6 of 1 Nephi caught my attention and led to some significant thoughts about agency. And it mattereth not to me that I am particular to give a full account of all the things of my father, for they cannot be written upon these plates, for I desire the room that I may write of the things of God. Wherefore, the things which are pleasing unto the world I do not write, but the things which are pleasing unto God and unto those who are not of the world. The following article was published at Mormon Interpreter. I’ve been waiting for someone to do the research and put together some good information on this subject and I think Jane did a great job. She’s the author of the book Discovering the Word of Wisdom which she wrote following her own personal journey toward health and wellness by seeking to follow the principles in D&C 89. Of all the things going on in the world, the Word of Wisdom might not seem to be very significant, but when the revelation itself states that it is “showing forth the order and will of God in the temporal salvation of all saints in the last days” and that “In consequence of evils and designs which do and will exist in the hearts of conspiring men in the last days, I have warned you, and forewarn you, by giving unto you this word of wisdom by revelation”, it sounds pretty relevant to us today. I don’t personally feel like it is my duty or obligation to tell people how they should live the principles of the gospel, but I do believe that giving people as much information as possible so that they can make their own decisions as guided by the spirit is my duty and obligation. Abstract: The 1921 edition of the Doctrine and Covenants included an additional comma, which was inserted after the word “used” in D&C 89:13: “And it is pleasing unto me that they should not be used, only in times of winter, or of cold, or famine.” Later authors have speculated that the addition of the comma was a mistake that fundamentally changed the meaning of the verse. This article examines this “errant comma theory” and demonstrates why this particular interpretation of D&C 89:13 is without merit. This can begin in the home. Before family prayer in the evening, invite each person to share a little bit about their day, what went well, what made them struggle, etc. Then, whoever offers the prayer will have real and important matters with which to take the to the Lord. Hearing your father, mother, brother, sister, son or daughter pray sincerely and specifically for you and your well-being is a rich experience. Imagine what an impact this could have as we apply these principles as we pray in our church meetings or during a home or visiting teaching session. When asked for volunteers to pray before and after a lesson this Sabbath day, why not raise your hand and experiment with these principles? When we move away from robotically “saying prayers” and towards genuinely offering prayers, we will find tremendous blessings and healing of souls. Yep, that’s it! You probably want a little background and explanation though, huh? I mentioned this process in an article back in August but didn’t elaborate on it. 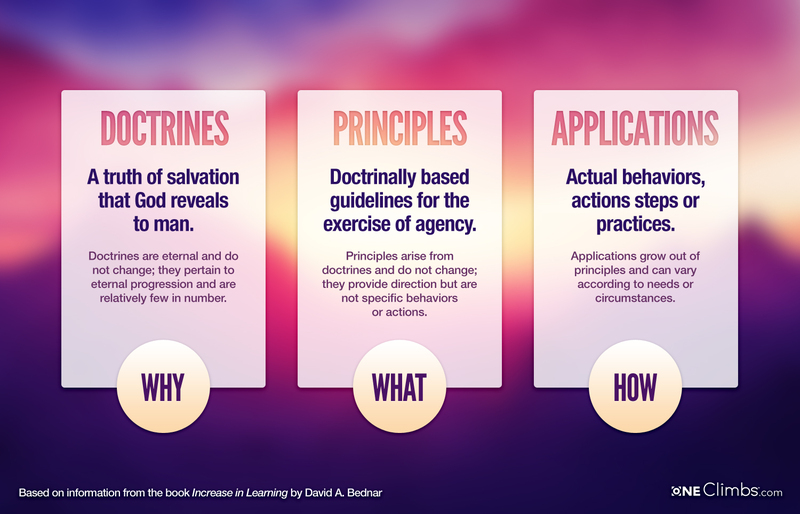 In his book Increase in Learning, Elder Bednar teaches that principles arise from doctrines. 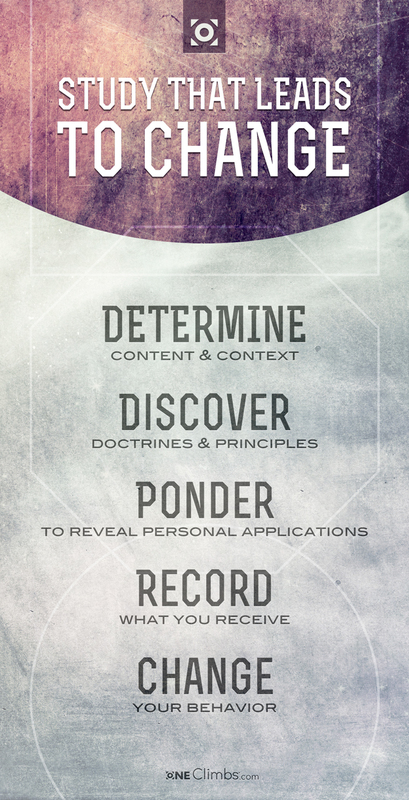 If we take any principle of the gospel such as faith, repentance, obedience, etc and ask the question, “Why is this necessary?” the answer will always be found in doctrine. Is the way you would answer based in doctrine? How would you answer that question in a way that focuses on the doctrine or doctrines that the principle is based on? What scriptures or teachings of modern prophets help us to obtain a more complete understanding of these doctrines?